With the region’s rich history in liquor production, a visit to Virginia’s Blue Ridge should certainly include a stop at a local distillery. Franklin County in Virginia’s Blue Ridge is known as the “Moonshine Capital of the World,” and bootleg whiskey production was a major part of the local economy for families during the prohibition era. Transporting moonshine from Franklin County across the border to North Carolina while evading police was part of what led to the creation of stock-car racing and Nascar. Franklin County’s moonshine history was also showcased on the silver screen in the film Lawless, starring Tom Hardy, Shia Labeouf and Jessica Chastain. Locals and visitors who want to learn more about that history can visit two distilleries in Franklin County - Franklin County Distilleries in Boones Mill and Twin Creeks Distillery in Henry. Both locations specialize in locally-made liquor, including rye and corn whiskey. The liquor can be sampled through tastings or mixed in with delicious, hand-crafted cocktails. Don’t forget to check the calendar to see if there are special events, such as live music or guided tastings, taking place during your visit. 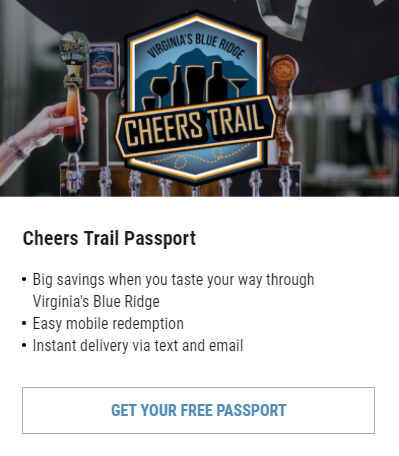 Don&apos;t forget to use the #VBRcheers hashtag on your social media posts that feature the fun places where you&apos;re enjoying craft spirits in Virginia&apos;s Blue Ridge! 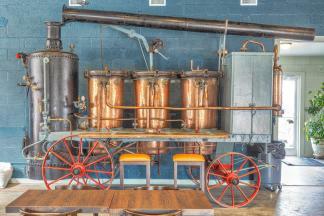 Learn how Franklin County became known as The Moonshine Capital of the World.